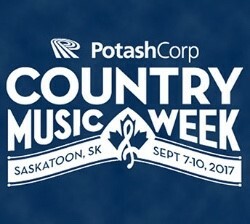 Country Music Week 2017 is being held this year in Saskatchewan from September 7-10 and they want to help you get there. CMAOntario is once again running a contest in tandem with the Canadian Country Music Association (CCMA) for your chance to win a once-in-a-lifetime opportunity to play alongside Canada’s brightest country music stars and most cherished legends during the Canadian country music industry’s largest annual event. Each province has been asked to select one country music act/artist (Act) to represent their province in the annual “CCMA Spotlight Performance Contest” (National Contest). When all the participating provincial Acts from across Canada are chosen for the National Contest, the selected Acts will be highlighted via an online poll set to go live on June 7, 2017 at 9:00am EST. That’s the time for Ontario to shine! The National Contest will run for 10 days, and will close on June 16, 2017 at 5:00 p.m. EST. The Act that receives the most votes on the poll by the time the National Contest closes will win a performance spot at a public, official CCMA-sanctioned event during Country Music Week 2017. The winner of the CCMA Spotlight Performance Contest will be announced on June 23, 2017. Acts that are interested in representing our province in this National Contest are required to complete their submission (requirement details below) online by May 10, 2017. You will need your CMAOntario Membership User Name and Password to apply for this performance opportunity. Please click the link below to login and submit your application. Once there, click on “Performance Opportunities” to complete your submission. Submissions will be juried by a CMAOntario Selection Committee, and one successful Act will be selected to move on to the National Contest. Note: In the case that the winner is a duo or band, the CCMA will review the prize package on a case by case basis.